Analog Artist Digital World: A 24 Hour "Old Sport Party" in Sorrento FL. The Old Sport party was also known as the Black Friday Boycott Party. The Wekiva Parkway is due to come through Kim Bucheit's property by this time next year, so friends went to enjoy Wise Acre Farm while they were able. It was time to make plans to chill out and share fun at Wise Acre Farm Thanksgiving weekend! Many of you "card carrying" party goers know the drill. If you have been meaning to come out to the farm, this is an ideal opportunity to enjoy it while it lasts (before the Wekiva Parkway goes through). It's a 24 hour extravaganza with something for everyone. Friends dropped in whenever it suited them, while others started early and went the distance. 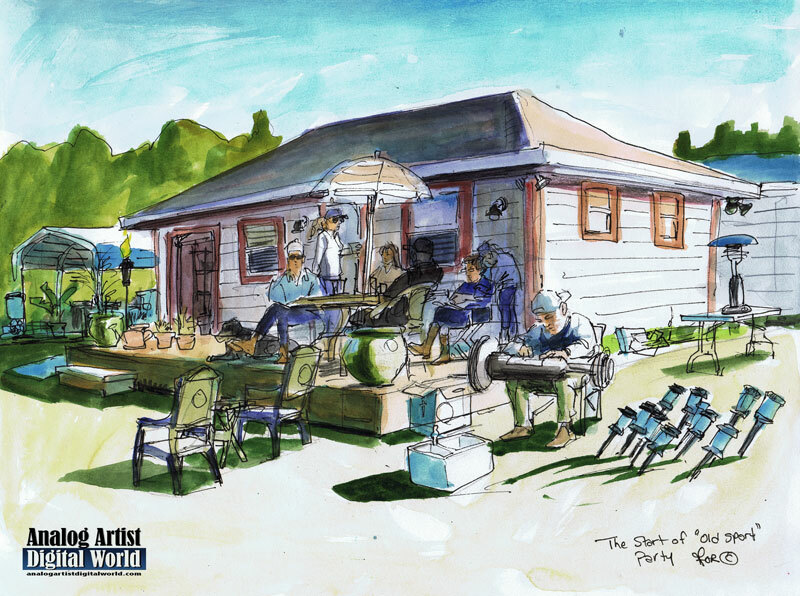 In my sketch, friends were just beginning to gather on the porch. A propane heater and a bunch of solar lights had been purchased for the party. The solar lamps leaned toward the sun to catch the rays. There was a corn hole tournament and after the sun set, a bonfire was built for everyone to gather around. The open garage was where the bar was set up.